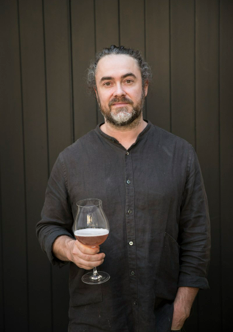 Adam James first became interested in fermentation whilst travelling through Japan five years ago. The exact moment was in sake bar Yoramu in Kyoto where he was served a plain cube of fresh tofu that was topped with an unassuming red paste. The paste was kanzuri and it changed his life. From that moment on he started reading, researching and experimenting in all things fermented. He has also returned to Japan every year to increase his knowledge of Japanese preservation. Adam started his fermentation/pop-up business, rough rice, four years ago. He is also the pervious owner/operator of Hobart’s “Tricycle Cafe”. Adam recently returned from a three month ‘fermentation world tour’ researching ancient (and new) techniques in vegetable and legume fermentation. The trip took him to; Denmark, Italy, France, Georgia, China, South Korea and Japan. He is now expanding his small boutique fermentary and has started supplying products to several top restaurants around the country.